The SpiderTech Tape company has created a comprehensive line of precut kinesiology tape applications for different parts of the body. Each application comes individually packaged with illustrated step-by-step instructions. These therapeutic tape products provide a convenient and inexpensive way for non-health professionals to apply kinesiology tape effectively. This is the second in a series of blogs describing the different SpiderTech applications, their uses and how to apply them. 1. Subject should be lying on stomach with leg relaxed. Remove half of the backing from section 1 and apply to the rear thigh, directly below the gluteal fold. Repeat with the other half of section 1. Gently rub the tape to activate the adhesive. 2. Place the hamstring muscles in a stretched position by having subject lie on side with leg straight and stretched forward. Begin peeling the backing from section 2 and apply directly over the hamstring muscles. It is not necessary to stretch the tape as it is applied. 3. 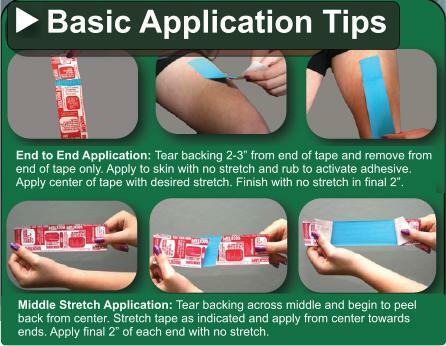 With the hamstring muscles still stretched, remove the paper backing from the outer arm of section 2 and apply the tape directly over the center of the injured groin area. Rub each section of tape immediately after applying to activate the glue. My last post outlined the benefits of the SpiderTech Groin Spider – a precut kinesiology tape application engineered for injuries to the adductor muscles in the groin area. The step-by-step application instructions were described. This post provides the SpiderTech Tape Groin Spider application instructions in both printable and video formats, showing exactly how the tape should be applied for best results. The Gold Medal run of the Night Train with Steve Holcomb’s World Champion USA1 4-man bobsled team may have had some friendly “spiders” along for the ride. 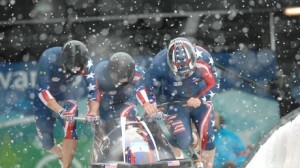 Shortly before the Vancouver Olympics, the US Bobsled and Skeleton Federation finalized a two-year sponsorship with SpiderTech, global leader in precut kinesiology tape technology. Kinesiology tape is now used by athletes of all ages and levels because of its amazing ability to relieve pain, reduce swelling and inflammation and accelerate healing. Most important to competitive athletes is the fact that this is accomplished without restricting range of motion. This allows athletes to continue to train and compete normally as they recover from many injuries, without worrying about developing secondary injuries from compensatory movement patterns related to restrictive taping. Precut kinesiology tape, made by SpiderTech, is a perfect choice for those who want the benefits of kinesiology taping, but have no training in cutting and applying tape from rolls. Each SpiderTech application is pre-cut for a specific body part. The back of each application is labeled and numbered, making it easy to follow the step-by-step instructions included in every package. Currently, there are 16 different applications available for virtually every part of the body. Individual packages are convenient to carry and apply. No scissors or cutting are required – just open the package and put it on. After a year and a half away from the tour, Justine Henin is staging an amazing comeback to the top ranks of women’s professional tennis. She recently made it to the final of the Australian Open, being defeated by Serena Williams. Throughout her matches, she wore kinesiology tape on her left inner thigh, probably for a strained adductor (groin muscle). Kinesiology taping is being embraced by athletes and trainers the world over because of its ability to relieve pain, reduce inflammation and provide support without restricting range of motion. This allows athletes with injuries such as muscle strains or overuse syndromes to continue to train and/or compete as they recover. Because kinesiology tape is so thin and elastic, it can be worn 5-7 days, providing therapeutic benefits the entire time it is worn. This is very different from conventional athletic tape which must be removed immediately after exercise. Another difference between kinesiology tape and conventional sports tape is the taping technique. Whereas sports tape is usually wrapped tightly around an injured muscle or joint, kinesiology tape almost never completely encircles any part of the body. Instead, it is applied over and around the affected muscle groups, as seen in the above image. This allows it to lift the skin, increasing circulation and lymphatic drainage, and relieving pressure on pain receptors under the skin. Kinesiology tape is available in rolls or in precut kinesiology tape configurations for specific parts of the body. In 2009, kinesiology tape leaped from the offices of a few forward thinking chiropractors and athletic trainers into the sports bags and first aid kits of people across the nation. Once the domain of trained clinicians, kinesiology taping is now being done in schools, homes and on the sidelines of virtually every level of every sport in existence. This has created a new need for kinesiology taping education. Most individuals aren’t willing to spend the hundreds of dollars and several weekends it takes to become officially certified in kinesiology taping techniques. On the other hand, without at least a basic knowledge of the principles of kinesiology taping, it is difficult to apply the tape effectively. There are several ways to learn how to apply kinesiology tape – instruction manuals, instructional DVDs, and online videos. This is the first in a series of posts that will provide an overview of the various manuals and DVDs that are available. We’ll start with pre-cut kinesiology tape, since it is the simplest to apply and requires the least amount of medical knowledge and taping expertise. Currently, SpiderTech Tape is the only supplier of kinesiology taping applications that are already pre-cut for different parts of the body. While using precut applications significantly reduces the skill needed to apply the tape, there is still a learning curve to becoming proficient. This manual contains step-by-step instructions for all 16 SpiderTech PreCut Kinesiology Tape applications. Each set of instructions includes photographs showing proper body positioning and product placement. The instructions are written in simple terms, requiring no technical background to understand. Also included is a brief explanation of the physiological mechanisms behind the SpiderTech products, as well as the 12 Principles for Application. Applications covered include Ankle, Calf and Arch, Elbow, Full Knee, Groin, Hamstring, Hip, Lower Back, Lymphatic (Small, Medium and Large), Neck, Shoulder, Upper Back/Postural, Upper Knee and Wrist. Softcover, 8’12” x 11″, 28 pages, $12.99. SpiderTech has produced an excellent series of short videos in which Dr. Kevin Jardine, the creator of SpiderTech Tape, demonstrates how to apply each of the 16 different SpiderTech Pre-Cut Kinesiology Tape applications. As he applies the tape, he explains exactly where to place it and how to apply each segment. 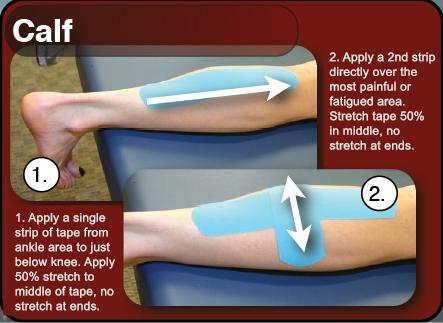 There is also a general Application Tips video, in which Dr. Jardine discusses tips for properly applying kinesiology tape, including skin preparation, tape and water, setting the adhesive, and basic application techniques. Watch these videos at www.theratape.com. Watch these videos on YouTube.